Get Out is one of the boldest, most audacious major studio movies to come along in quite some time. 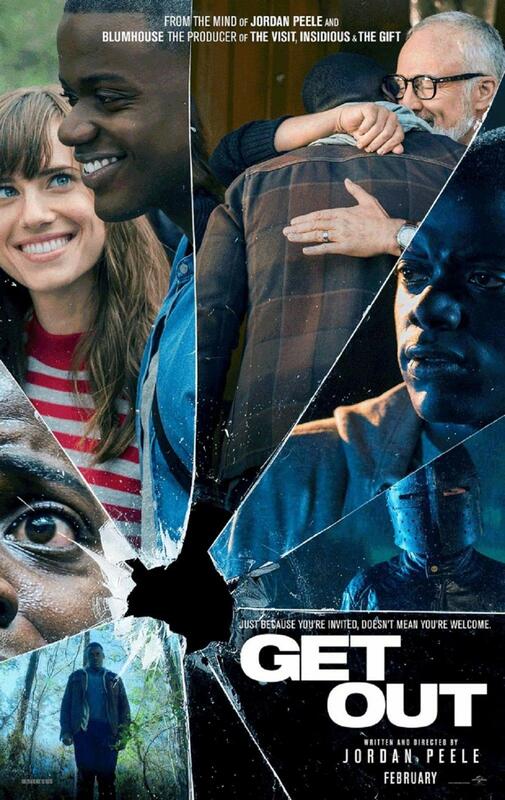 Daniel Kaluuya (Sicario) plays Chris Washington, a young African-American man whose white girlfriend Rose (Allison Williams of HBO's Girls) is planning to take him to meet her family at their secluded estate. At first, her neurologist father Dean (Bradley Whitford) and psychiatrist mother Missy (Catherine Keener) seem to be trying too hard to show that they're totally cool with the fact that their daughter is dating a black man. Her brother Jeremy (Caleb Landry Jones), on the other hand, goes out of his way to send an uncomfortable vibe. Chris quickly notices something distressingly odd. The family has a black housekeeper and groundskeeper (played, respectively, by Betty Gabriel and Marcus Henderson). Both behave very woodenly and seem slightly hostile to Chris's presence. Same goes for a black family friend (Lakeith Stanfield). After Missy hypnotizes him to stop smoking, Chris comes to suspect that something at the estate is very, very wrong and that, as an African-American, he may be in danger. Few things are as exhilarating as seeing an artist work outside his or her comfort zone and really nail it. That's what happens here. Get Out was written and directed by Jordan Peele, best known as half of the comedy duo Key & Peele. Their Comedy Central show was a huge hit, and their debut movie, Keanu was pretty funny in its own right. Despite tremendous success in that realm, Peele has opted to make his directorial debut with a horror movie. He shows impressive storytelling confidence in this new format. Actually, Get Out is more than a horror movie. It virtually invents a whole new category. Call it horror-satire. The film is not a traditional fright flick, designed to scare the audience with cheap jolts. Instead, familiar horror elements are utilized for the purpose of social commentary. There is some humor, courtesy of Chris's wisecracking best friend Rod (played by scene-stealer Lil Rel Howery). Mostly, though, the atmosphere of dread and the gruesome events of the third act are used to touch on issues of race. Without giving anything away, Peele's story puts its lead character into a terrifying situation that, for the audience, explores self-serving liberalism. Many of the white people Chris meets are seemingly open to him. No one expresses any problem with Rose dating a black man. But that doesn't mean that they value him as a person as much as they value Rose, or anyone of their own race. Just because they pat themselves on the back for being open-minded doesn't mean they really are. Get Out's true horror is in the unrecognized trait some white folks have, where they convince themselves that they celebrate racial diversity, even as they're saying and doing things to demean black lives. Chris finds himself in a place that seems accepting at first, but really isn't. That proves worse than entering a situation that's clearly antagonistic up front. There are a dozen different ways Get Out comes at that idea, none of which I would dream of spoiling for you. What's important to know is that Peele's ultimate message is that discrimination is a minefield people of color have to navigate carefully. Some of the land mines are out in the open. Others are buried. None of them are good. For a horror movie to offer up such a provocative theme is admirable. For one to do so while still being really entertaining is even more wondrous. Peele has an outstanding cast, led by Daniel Kaluuya in a star-making performance. The great thing about the actor is that he has a unique, non-obvious way of playing Chris's concerned befuddlement over his situation. That keeps us riveted. Scenes of suspense are executed with great style and wit, while the intermittent moments of humor hit the bullseye. From the opening titles to the end credits, Get Out holds you in its grasp. Jordan Peele clearly understands that horror is a flexible genre, one that can sustain thoughtful ideas and possess a satiric bent. With only one film as a director, he establishes himself as someone whose future efforts should be anticipated with great enthusiasm. Get Out is rated R for violence, bloody images, and language including sexual references. The running time is 1 hour and 43 minutes.